The Biograph Theater, a former neighborhood movie theater, is a City of Chicago Landmark. Its façade is restored but behind it, an entirely new theater complex has been created to house the Tony Regional Theater Award Winning Victory Gardens Theater Company. In addition to a new 299 seat Playhouse, it has all new audience amenities, performer and administrative support areas, mechanical and electrical infrastructure improvements, and new theatrical specialty systems. 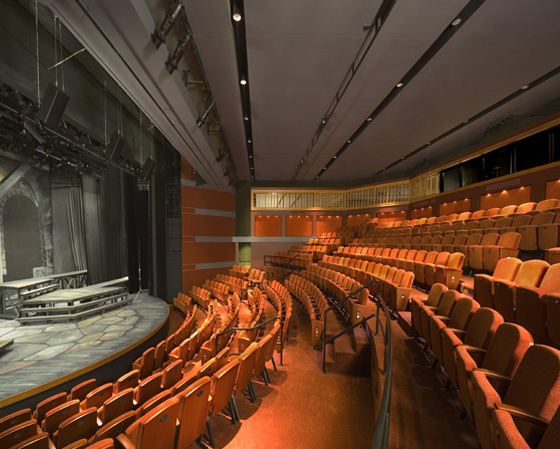 The second level has a rehearsal hall and a smaller 99 seat stage. In addition, the lobby area is carefully designed to support the new theater configuration. It improves circulation and accommodates generous concessions & merchandising, opportunities while it also provides ample toilet room capacities. A highlight is the concierge style ticketing area. The new warm and intimate 299 seat theater space has been acclaimed as perhaps the best small playhouse in Chicago.